What are the words you live by? The Romans had carpe diem. Gandhi advised to “Live as if you were to die tomorrow.” All the Twitter tweeners have #YOLO, which I personally loathe, but to each their own. I’ve always gravitated towards the words of the doctor of gonzo journalism himself, Hunter S Thompson, who said, “Buy the ticket, take the ride.” So far, 2014 is quickly turning into The Year of Tickets & Rides. It started this last Christmas when, like always, I was struggling with my holiday shopping. I’ve never been the greatest at getting people stuff because it always feels so impersonal, but something shifted my perspective this year. Instead of buying stuff, I went looking for experiences I could share with my loved ones. So I proceeded to buy a bunch of tickets of different types for my family and friends – some for concerts and trade shows, others for movies and wrestling tournaments, all in hopes of sharing one of the most precious gifts, our time. Yep, I’m going snow skiing. 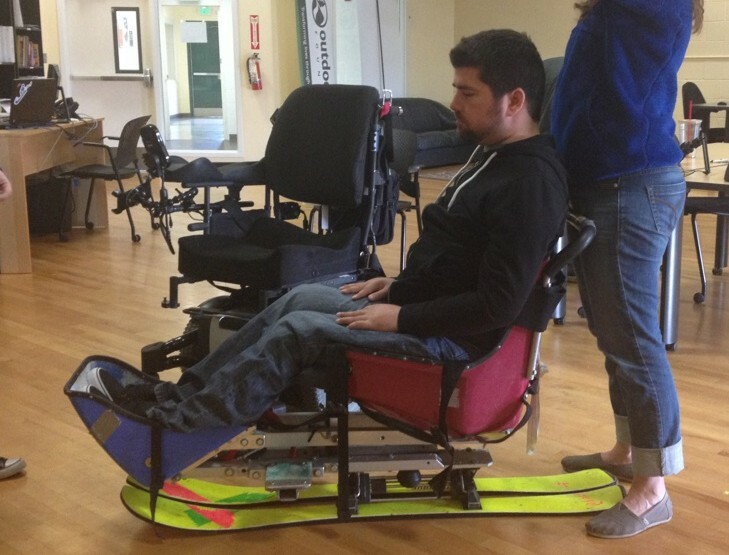 With the help of the good people at the Outdoors for All Foundation, I’m going back up on the slopes for the first time since I broke my neck on February 11, 2004. And yes, I’m going back to the same place where it happened, The Summit at Snoqualmie. It’s undoubtedly going to be an emotional adventure because that hill and I have much deeper history than that one fateful night. Not only is it where my life changed forever in an instant, it’s also the very same place where I learned to ski almost 30 years ago. So that mountain holds a lot of emotional turmoil; not just for me, but for my family as well. There is my dad, who taught his son to ski at the tender age of 4, and instantly saw glimpses of the daredevil the boy would grow up to be, having to knock the kid over just to keep him from bombing straight down the hill, not knowing that 20 years later, he would have to hold the young man’s shin in place while the medics tried to remove the ski boot from his leg with a broken femur, and watch his face not even flinch to register what should have been excruciating pain. There is my mom, who gave up skiing a decade before my accident because she just couldn’t keep up with her freewheeling kids, and still can’t drive eastbound on I-90 over Snoqualmie Pass without tears flowing uncontrollably over a life she never wanted for her little boy. And finally, there is my sister, who not only lost her able-bodied baby brother in the tragedy, but also had a good bit of her identity get swallowed up in the collateral damage of being the sibling of a quadriplegic, where all of your completely valid troubles are seemingly trumped by your brother’s vast medical history. But as emotional as this trip is surely going to be, it’s an incredible opportunity to replace those painful memories and start fresh. There is a whole new generation that has missed out on the last decade of what was a sacred family tradition because, up until recently, no one from my family had been back on the slopes since that fateful day until a couple months ago. That all changed when my the rockstar that is my oldest niece signed up for lessons through our school district and went up without us. It also sends a message out to God, fate, the universe or whatever does or doesn’t exist out there that the tragedy that rocked this family 10 years ago may have shaken us to our core, but it did not break us. At this point, I’m sure you’re about sick of reading a bunch of dead people’s words, but I can’t resist wrapping it all up with one more from Ralph Waldo Emerson, who put it simply “I hate quotations. Tell me what you know.” Here is what I know. I’m not sure about you, but I’m fairly certain I was put on this rock to do life – two of the simplest words to say but hardest to execute. Life is unpredictable, difficult and scary. That stark reality makes it really hard to step outside your comfort zone and face the unknown. But if you let the fear control you, it can rob you of precious opportunities; opportunities to grow and to build memories with the time we have left. Tomorrow is going to be a cold, uncomfortable and stressful day as the folks from OFA try to cram me into that contraption and toss me down the mountain next to all of my family and friends. It’s going to be awesome. Here’s hoping the rest of you can follow our lead in heeding the good doctor’s advice and buy some tickets of your own. Oh Kenny, You are a remarkable young man. This is so well written. You have been through so much and have always been strong and kept such a positive attitude. You are a great example for everyone, no matter what they are going through. I know that trip will be tough for everyone but I admire you for doing it and hope you have a fantastic ride! God Bless and be with you Always. Congratulations on getting back on the hill. I’m sure it will be tough in many ways but it could also prove to be an exhilarating day. Enjoy your ride and come back and tell us all about it please! Your writing young sir is amazing. This is an incredible journey you’ve been put on and you have rocked it. I like the words of dead people, but I also really enjoy reading your perspective! Hope it was a blast! I’m so glad I found your blog. It is amazing to read your posts. I’m in awe of your courage, and humour, and your ability to share your life with others through this blog.